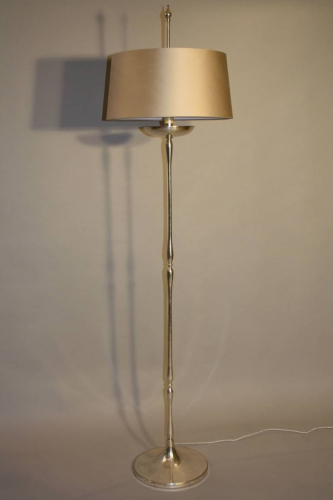 A very elegant silver floor standing lamp with interesting disk detail to top. An unusual design. Spanish c1950. Height to shade top is 176cm and shade width is 45cm. The base diameter is 30cm. The shade is included in the price and has been recovered in a silver/pale gold silk. Rewired and PAT tested for UK use.